Any problem in geometry can easily be reduced to such terms that a knowledge of the lengths of certain straight lines is sufficient for its construction. Just as arithmetic consists of only four or five operations, namely, addition, subtraction, multiplication, division and the extraction of roots, which may be considered a kind of division, ... And I shall not hesitate to introduce these arithmetical terms into geometry, for the sake of greater clearness. The reader may be surprised at encountering such an investigation which at first view appears wholly dissimilar to it; but the exposition will show very clearly the actual relation between this topic and the transcendental arithmetic. And if it can be solved by ordinary geometry, that is, by the use of straight lines and circles on a plane surface, when the last equation shall have been entirely solved there will remain at most only the square of an unknown quantity, equal to the product of its root by some known quantity, increased or diminished by some other quantity also known. Then this root or unknown line can easily be found. 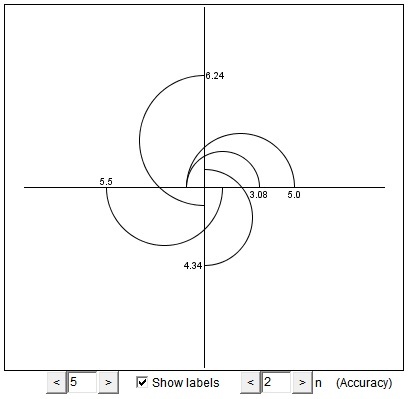 The first diagram depicts the construction for n = 4. I hope that showing the numbers obtained on consecutive steps makes the diagram clear. First draw a semicircle on the segment of the x-axes between points (-1,0) and (4,0). Its intersection with the yaks occurs at point (0, 4). Extend the second coordinate by 3 and use the new point as the other end of the diameter of the second semicircle. (The first being (0,-1).) Etc. The second diagram shows the construction for n = 124. Unfortunately, there is no room to show all the quantities obtained on every step. may have other interesting properties, but there is one you may verify toying with the applet. For any n, the numbers above are less than 2.